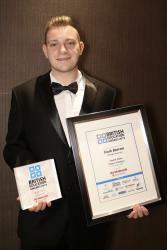 Mark, received his Award at a Ceremony at the Hilton Hotel in Manchester. Mark follows Bangor graduate Maisie Prior who won last year’s Higher Education category. “The School where I studied was excellent. Pastoral support was better than you’d expect, with academics always being on hand to help, support and provide guidance to students.